At MHSRS (Military Health Science Research Symposium, 2014) a study was presented examining the effectiveness of the MolecuLight i:X for detecting subclinical bacterial contamination and guiding antimicrobial wound treatments. 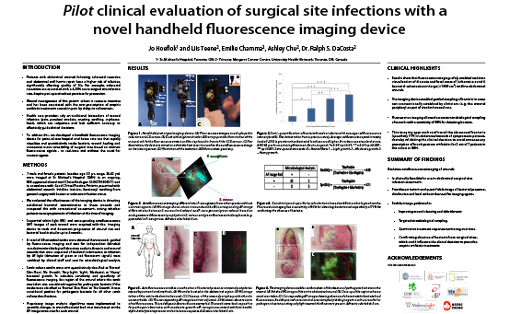 Handheld fluorescence imaging, used adjunctively with standard clinical signs and symptoms (CSS) at the bedside, enabled better detection of otherwise subclinical bacterial colonization in surgical sites. This enabled image-guided microbiological sampling and reduction of unnecessary administration of antibiotics. Patients (n=7) with abdominal wounds (midline incision, ileostomy) from general surgery with unknown infection were enrolled in this pilot clinical trial (ClinicalTrials.gov ID:NCT01650571). We evaluated the effectiveness for detecting subclinical bacterial contamination and guiding antimicrobial wound treatments when combined with CSS assessment. Patients were followed for up to 4 months to track and document progression of wound size and bacterial load in situ. Division of General Surgery and Gastroenterology, Specialized Complex Care, St. Michael’s Hospital, Toronto, Ontario, Canada. Princess Margaret Cancer Centre and Techna Institute, University Health Network, Toronto, Ontario, Canada.